Tokyo: A Japanese skating rink that froze 5,000 dead fish into the ice as an attraction for visitors has been forced to close after receiving a barrage of criticism. Amusement park Space World is now melting the rink — which could take about a week — and will hold a memorial service for the fish, the company said. 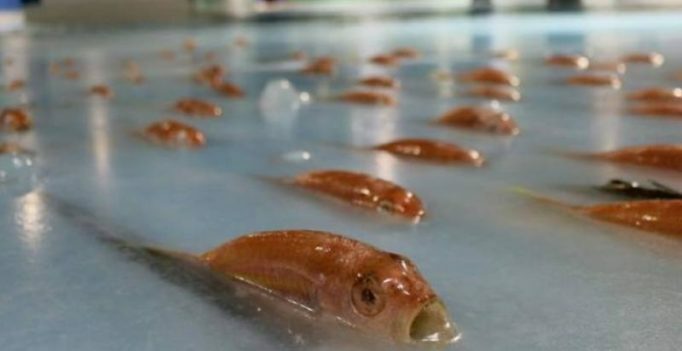 The rink in southwestern Japan opened on November 12, after 5,000 fish were frozen under the surface of the ice as a decorative effect while customers skated above. But the concept was slammed as unethical and the rink in the city of Kitakyushu was forced to close on Sunday, Space World spokesman Koji Shibata said. “We received critical voices saying it is not good to use creatures as a toy, and that it is bad to let food go to waste,” he told AFP on Monday. Social media erupted, with one visitor to the park’s Facebook page writing: “An event on an ice rink with frozen fish… How sinful.” “This is not personal but a social issue. They made food into a toy where children go and play,” said another. Shibata said the fish were all already dead at the time of purchase and were considered unfit to be sold in markets. “Internally we’d had discussions over the morality of the idea” before the display was set up, he said. Toshimi Takeda, general manager of Space World, said the intention was for customers to have fun while also learning about fish. “We wanted customers to experience the feeling of skating on the sea, but after receiving criticism, we decided that we could not operate it any more”, he said.